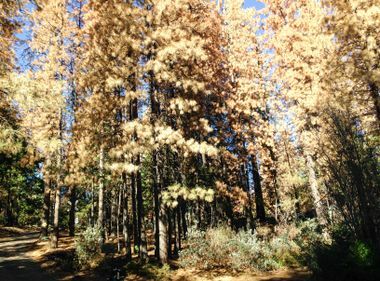 Millions of white fir trees in the Sierra Nevada had died because of the drought and bark beetle infestation, raising the danger of wildfire. Dead trees ravaged by drought and the bark beetle dot the landscape at Shaver Lake in the mountains east of Fresno. Bark beetles infect trees with the blue stain fungus hastening their death and reducing their value as timber. Southern California Edison has removed 16,000 dead trees in the Sierra Nevada to reduce the hazard of wildfires. Crews are out in force clearing trees and making emergency plans to prevent a record die-off in the state’s forests from impacting customer service. Richard Hawkins smiled as the helicopter flew over communications towers clustered on a granite mountaintop in the Sierra Nevada east of Porterville. 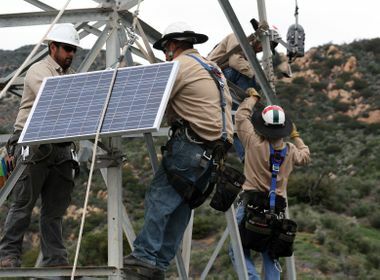 The rocky mountaintop means the communications towers — which provide cell phone and television signals to parts of the San Joaquin Valley — should be safe if a wildfire sweeps through. That was good news for Hawkins and Dietrich, both 40-plus-year veterans of the forestry and fire service, who were doing a wildfire assessment of the Central Sierra Nevada for Southern California Edison. Earlier, they had viewed facilities and planning at ground level. On this trip in mid-September, they were looking at communications facilities in the mountains in eastern Kern and Tulare Counties. From January through September, 55 crews felled 16,000 trees, with another 9,800 identified to be cut down. SCE ramped up planning for potential wildfires several months ago due to the die-off of an estimated 66 million trees in the Sierra Nevada. The trees, ravaged by five years of drought that made them more vulnerable to the deadly bark beetle, pose a major wildfire threat. The Erskine and Cedar fires this summer were a preview of the kind of large, fast-moving blazes that might come. The tree die-off is of concern to SCE because most of the company’s hydroelectric facilities, its Camp Edison recreational area and miles of power lines are in the heart of the area. 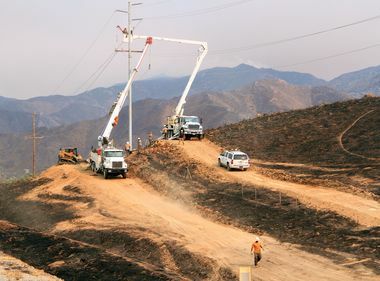 “We want to make sure we have done as much as possible to plan for the safety of our employees and the public and to maintain the reliability of the grid,” said Tom Jacobus, the SCE principal manager overseeing the company’s Wildfire Management Task Force. The task force got a head start by building on the lessons learned during the decade-long fight to remove bark beetle-infested trees in the San Bernardino Mountains. Jacobus said the Sierra Nevada mitigation project is even more daunting because of the magnitude of the devastation. Every time patrols check the power lines, they find new dead trees. SCE has moved aggressively to address the problem. From January through September, 55 crews felled 16,000 trees, with another 9,800 identified to be cut down. Others on the wildfire task force have focused on the power grid, studying more than 300 circuit miles in the high fire hazard area and prioritizing those circuits with the biggest potential impact on customer service. Recognizing the limited access to many of these mountain areas, evacuation routes for employees and the public were mapped out. They also identified sites to shelter in place or that could be used to safely await an airlift out. SCE also stepped up coordination with federal, state and local authorities. Hawkins and Dietrich could see the magnitude of the challenge from the helicopter as they flew over miles and miles of dead and dying forest.